This page created 15th August 2018. 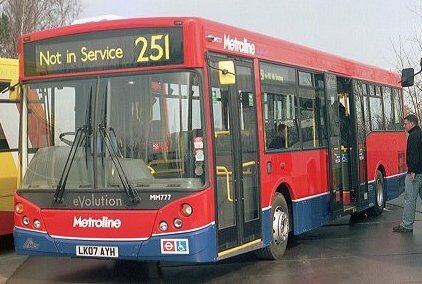 Metroline already had experience with MAN buses, albeit of the step-entrance variety with Marshall bodywork. They had taken over fifteen from R&I back in June 1996, and then bought another nine, with Marshall Capital bodies, in December 1996. All had gone by mid 2005. Now, in 2007, they needed buses for contract renewals. First was the 251 (Edgware Stn - Arnos Grove), where eleven new MMs (771-781) started operation in May 2007, taking over from DLD Dart SLFs. They were 10.4m MAN 12.240s, with MCV eVolution bodywork. 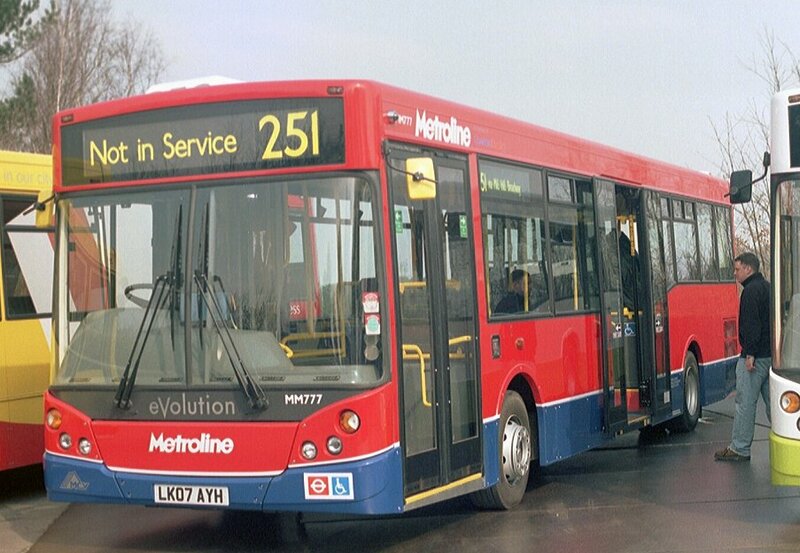 They were in standard Metroline livery of red with a blue skirt and white cheat-line. Roofs were white, with white air conditioning units. Brand new MM777 at Showbus, Duxford, in September 2007, correctly displaying that it was not yet in service on the 251. Another five (782-786) arrived in late August/early September. These were Euro-4 engined, rather than the Euro-3 of the earlier batch. They were nominally for route 206 - aso North Wembley - but mixed with the earlier batch on 206 and 251. A further four (MM787-790) of the same batch arrived late in September and dribbled into service in October. Later in October 2007 the batch of eighteen (MM810-827) for route 90 (Northolt - Feltham) started to appear at Perivale, and trickled in until mid-December. In November or December the registrations of 787-790 were swapped around. Presumably someone had discovered that the VINs and registrations did not match. Fleet numbers were changed to suit in January 2008. MM817 on the 206, September 2010, first seen near Brent Park heading for St.Raphael's, then an hour and a half later in Kilburn. In May 2009 North Wembley Garage closed operationally, and its routes and buses went elsewhere. The 215 lost its MMs as it moved to Cricklewood. MM771-790 went to Perivale for use on the 206 and 232, plus the still-resident 90. The Peak Vehicle Requirements were much the same. MM781 at the bus station behind the Brent Cross Shopping Centre, on a 232 heading for Turnpike Lane Station, September 2010. Perivale's MMs made occasional appearances on double-deck route 460 (North Finchley - Willesden Garage). In November 2011 the 90 was moved to West Perivale, but the MMs remained for a while at Perivale, moving onto route 70 instead of DLDs. This was due to the small number of drivers at West Perivale type-trained on the MMs. But in January (2012) seventeen of the MMs made the transfer to West Perivale to resume duties on route 90, leaving the soon-to-be-surrendered 70 to elderly DLDs. MM825 followed in February, with MM785 and 823 in April. 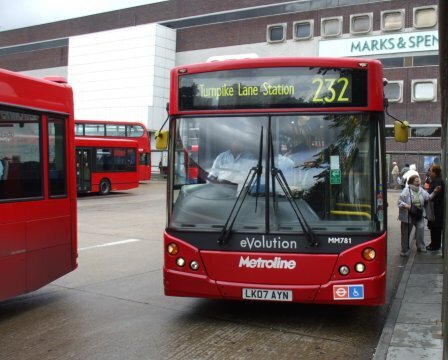 At the beginning of June 2012 Metroline relocated the 232 to Cricklewood. Most of the remaining MMs moved to West Perivale for use on E6 and 90. Just six MMs stayed at Perivale to help out on route 70 until that was lost to First later in June. There followed a period of fluctuating allocations between Perivale and West Perivale. In December 2012 five MMs were placed in store at Perivale, and were converted for driver-training. They emerged in June 2013, and went to Brentford as trainers. Four more followed. During 2014 these trainers (MM771-778, 781) were repainted all-red with white recruitment vinyls. Nine MMs were withdrawn from West Perivale in August 2013, replaced by EnviroDarts. For the next couple of years buses went into and out of store as required, with service at West Perivale and store mostly at non-operational Perivale. In March 2015 Sullivan Buses of South Mimms bought six of the MMs: MM786-788, MM814, 821, 824. MM821 was for spares, but the other five were intended to replace Darts on routes 306/306A (Borehamwood-Watford). They also appeared on the 306B and 398 to Potters Bar and the 950 between Thorpe Park and Staines Station. The summer of 2015 was a time of upheaval for the remaining MMs. In July five were reallocated to Brentford to join the mixed allocation on route E8, with another three following in August. They were withdrawn from service at West Perivale in July and August 2015, when the 90 converted to double-deckers and the E6 to EnviroDarts. They were retired from passenger service in May 2016, MM785 being the last into Brentford Garage off the E8. Many continued in service as driver trainers, either having undergone the conversion with extra mirrors, all-red livery and recruitment vinyls - or not. Ian's Bus Stop MAN index. main text. bus histories. photos.